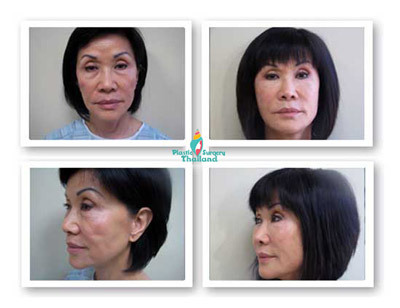 The Cell Enriched Facelift in Thailand is also known as the “Natural” Facelift, CAL Facelift or most often the “Stem Cell Facelift.” This is a recent scientific breakthrough that basically utilizes the most modern & advanced medical technology available in the world today that is bringing us one step closer in our never-ending search for the elusive “Fountain of Youth”. The Aesthetic Center is a leader in providing adult cosmetic stem cell rejuvenation therapies such as the NEW Stem cell facelift and very popular CAL breast enlargement for women and CAL Chest for Men. PST and its medical partners have created and improved upon the original Stem Cell face Lifts in Bangkok to quickly and safely restore your youthful glow and appearance 100% naturally by using your adipose fat derived stem cells without the downtime and risks of major rhytidectomy facelift surgery. By using your own unwanted fat derived stem cells the treatment has zero chances of rejection or complication and is therefore very safe. The same technique is also used for stem cell breast enlargement surgery. The usually painful, risky and often difficult traditional face lift surgeries (rhytidectomy) have been transformed into safe, affordable and 100% natural treatment solution. The revolutionary new treatment does this By making use of your very own stem cells. Our cosmetic stem cell doctors in Bangkok are able to extract the stem cells,process them in our state-of-the-art closed system stem cell lab, and expand them to instantly repair,rejuvenate and restore your face’s wrinkles and defects into a much more attractive and youthful way that makes it nearly extremely safe,permanent,undetectable thus earning the title of a 100% natural face lift. For decades now,plastic and cosmetic surgeons around the world have used autologous fat grafts from patients’ own bodies to help restore fullness and decrease wrinkles in the neck,face and hands. 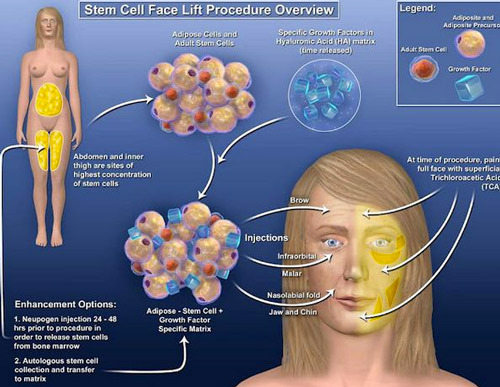 Adult Stem Cell regeneration was first used in cosmetic reconstruction surgeries such as CAL or “cell assisted lipotransfer” and stem cell breast reconstructions surgery after women had had mastectomies or severe burns. Many Post breast cancer patients around the world have also started taking advantage of today’s stem cell regeneration treatments as a natural alternative to reconstructing the connecting tissues without expensive invasive surgeries and/or implants. Active adult Stem Cells are circulating in your blood and body 24/7/365. You can also locate & extract stem cells in dental or tooth pulp,bone marrow,adipose (fat tissue ),placenta and umbilical cords.Plastic Surgery in Thailand and its a partners DO-NOT use animal derived “Live Cell” or embryonic derived stem cells. The stem cell facelift in Bangkok has a unique patented protocol that calls for the stem cell doctors to remove about 120-250cc of your body-fat via a minimally invasive mini-liposuction. The stem cell rich fat can ONLY be removed from the abdominal areas and thighs so women with low BMI (Body fat) may not qualify for this treatment. The fat for your stem cell facelift in Thailand is extracted filtered and processed in the lab to filter the dormant cells from the active Progenitor cells and CD34+ stem cells. These powerful stem cells are then “fortified” or “cultured” further using PRP and growth factors to achieve medical grade dosages. Please note that this “culturing” and fortification is not offered in countries such as the United States and Australia due to government restrictions so please keep that in mind when comparing your options. The “fortified” MSC+ stem cells contain the necessary components needed that help trigger “angiogenesis” or blood vessel and tissue regeneration. 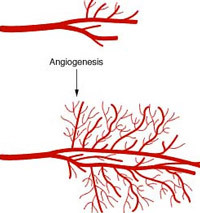 This process of angiogenesis is the secret behinds CAL stem cell breast and stem cell face lifts. The blood and tissue regrowth helps brings your face,hands and neck back to its youthful elastic rejuvenated form.